a living heritage of good food! 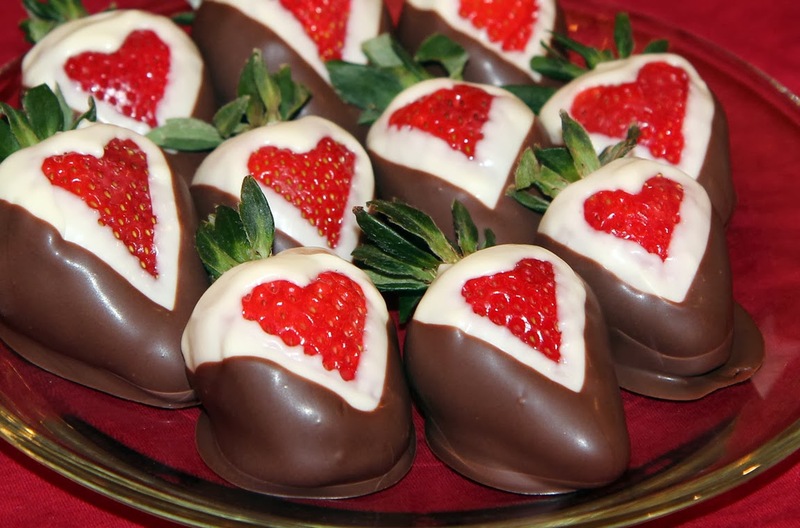 These gorgeous chocolate dipped strawberries are a real treat for a special occasion. 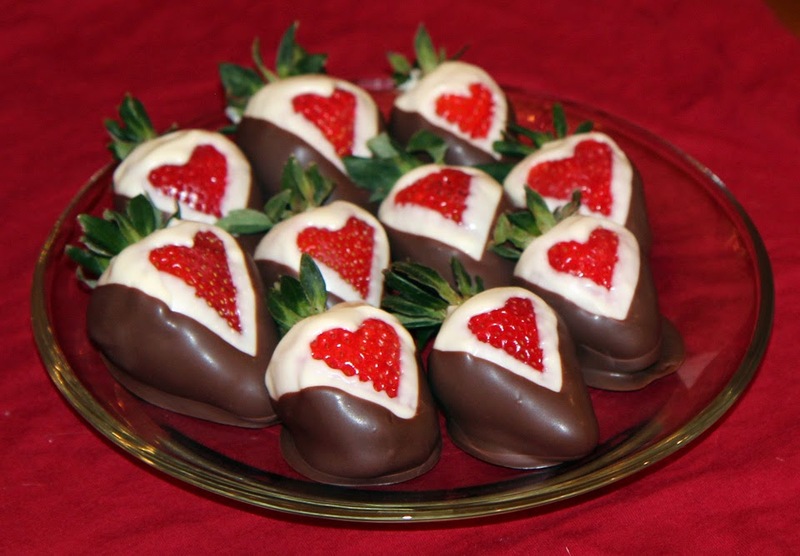 Plain chocolate dipped strawberries are a very easy and elegant treat, but these heart dipped strawberries would be really nice for Valentine's Day, Mother's Day, or an anniversary. Choose your strawberries carefully, so you will have more than enough for what you want. 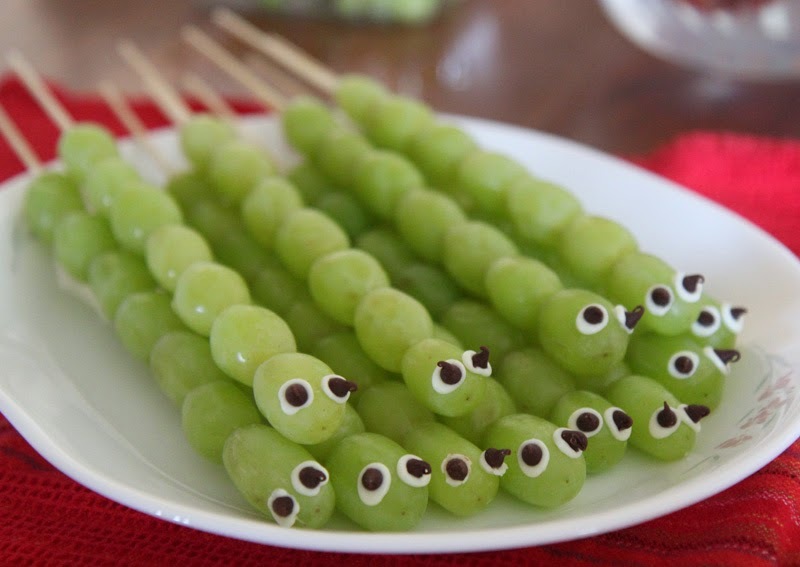 If the tops of the berries are too green, the berries won't taste very good. Make these the day you want to serve them. They only keep for a day or two. Wash and dry the strawberries, and then lay them out on towels or paper towels to dry. The berries have to be completely dry, since even a drop of water can ruin the chocolate, making it lumpy or making it seize completely. Just leave the strawberries out to dry for an hour or so. The berries will be at room temperature, which will make them easier to dip. Usa a good quality dipping chocolate. You don't want to do all this work and have the chocolate taste like wax, or be lumpy. 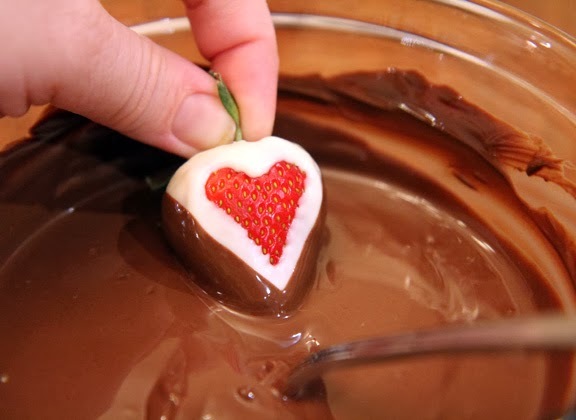 You can also use 8 ounces of good quality chocolate melted with 2 tsp. of unsalted butter or shortening to get the right consistency for dipping. You will want this chocolate to be a little "runnier" than you would use for dipping chocolates. Get everything out and ready. Put some parchment or wax paper on a cookie sheet or shallow dish and clear a space in your refrigerator for the tray. Melt half of the white chocolate (8 oz.) in a glass bowl in the microwave. Melt the chips for 30 seconds at 50% power, stir, then repeat until the white chocolate is melted. Put the other half of the white chocolate chips (8 oz.) into a heavy-weight (freezer) baggie. Put the bag of chips in the microwave at 50% power for 30 seconds. Knead the bag a little, then microwave it for another 30 seconds at 50% power. Knead the chocolate again, and repeat microwaving until the chocolate is melted. Be careful not to overheat the white chocolate. 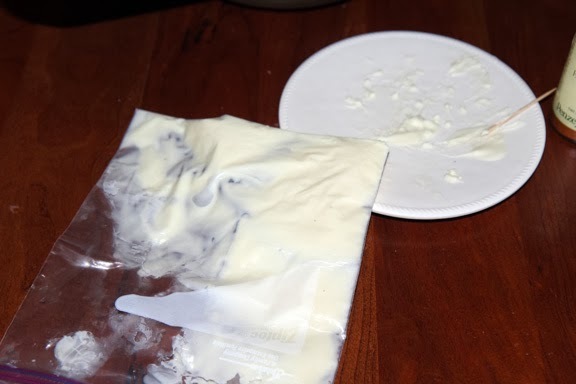 When the white chocolate is melted and kneaded smooth in the bag, snip off a tiny corner of the bag. Squeeze some chocolate on a plate (or your finger) to see how the chocolate comes out. It should be a small enough hole to make good lines, but enough to not take a huge effort to squeeze it out. The line should be about the width of a toothpick. Snip off a tiny bit more if the chocolate won't come out smoothly. Choose one of your not-so-pretty strawberries for practice. Gather the leaves together and hold the berry at an angle. Dip one side of the berry into the white chocolate, about a third of the way across the front of the berry. 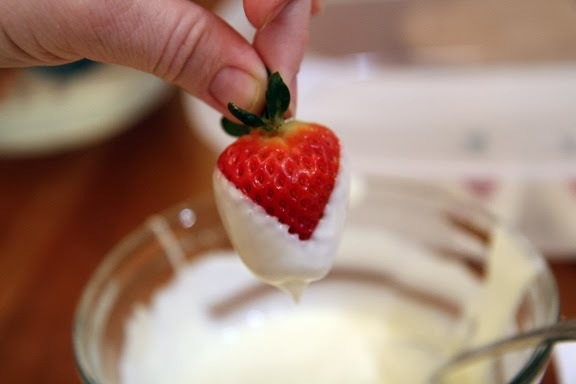 Tip the berry onto its other side and dip the strawberry into the white chocolate, trying to create a symmetrical point for the bottom of the heart. 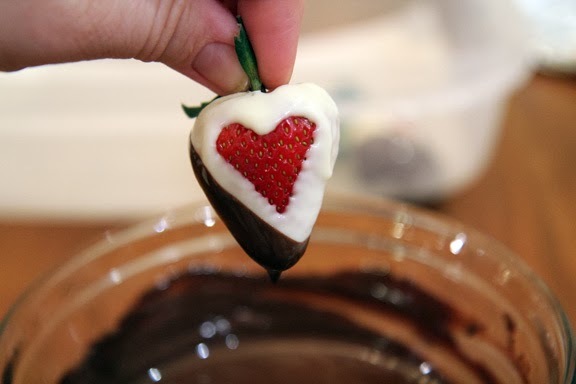 While still holding the strawberry over the bowl, use the bag of chocolate to draw the top of the heart onto the berry. Start on one side of the heart and draw a curve upwards into the center of the heart. 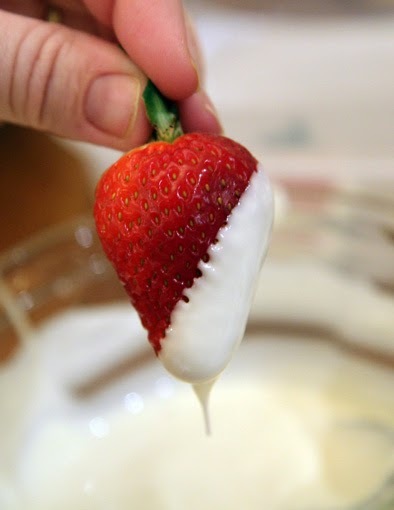 Squeeze some more chocolate behind the curve to cover the top of one side of the berry. Start on the other side of the heart and again draw the second curve upwards into the center of the heart. Don't worry about getting a perfect point or an exact curve. 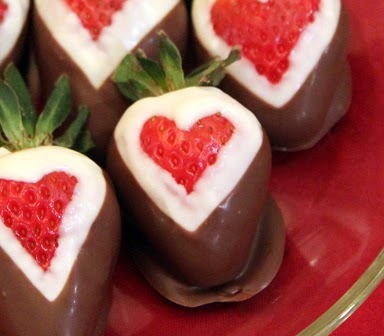 Again fill in the space behind the heart so the top of the strawberry is covered with white chocolate. You will need to work a little quickly to get the chocolate to lay smoothly. 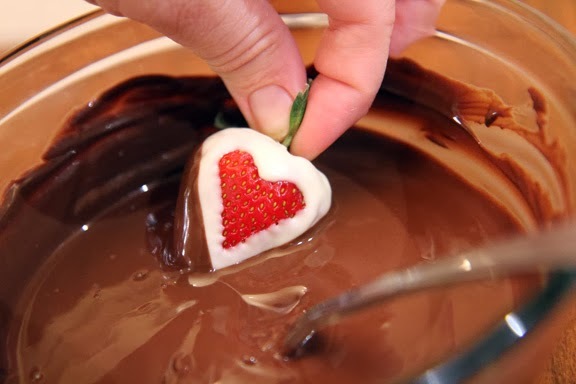 Shake the berry a little bit with the heart shape facing up to smooth the piped chocolate and remove some of the extra chocolate. 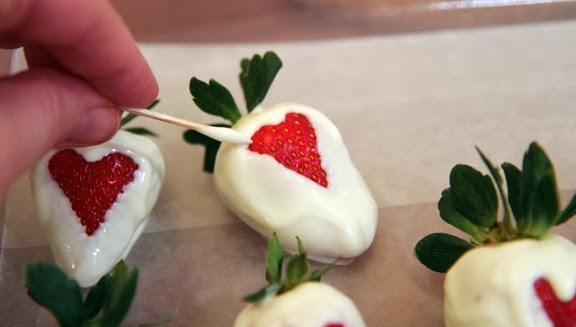 Place the berry on the wax paper, and use a toothpick dipped in white chocolate to touch up the shape of the heart. 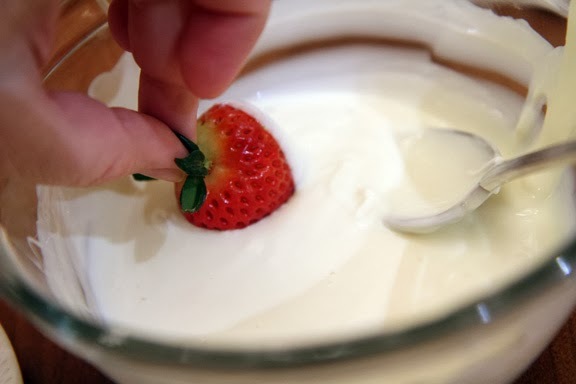 Continue dipping the strawberries, drawing the heart, and touching up the shape until you have done all the strawberries. When the chocolate in the bag starts to thicken, microwave the bag at 50% power for about 20 seconds to melt the chocolate again. 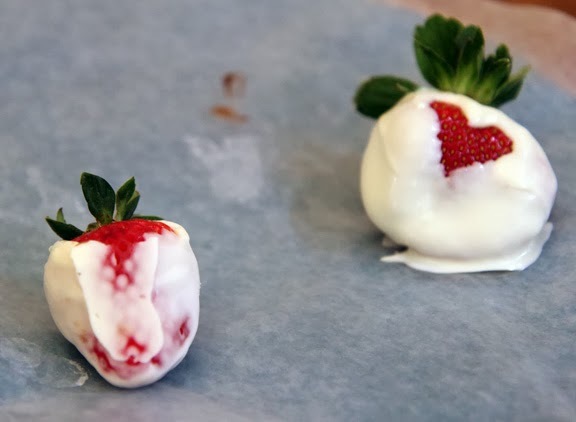 You should be an expert strawberry decorator by the time you are done! And by the way, don't worry about the back of the berry at this point. The back won't look that lovely right now, and that's ok, since the chocolate layer will cover this up. 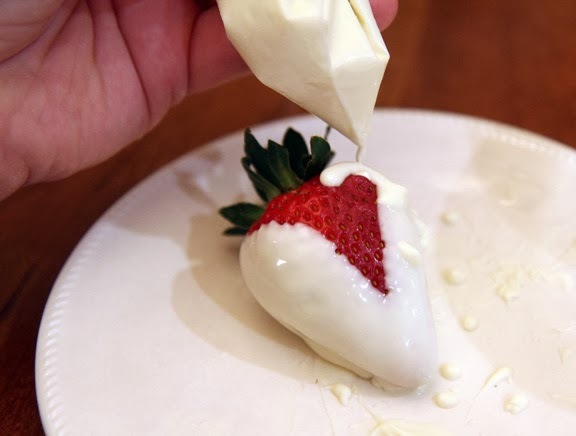 When you are done with all the berries, put the strawberries in the fridge for about 10 minutes so the white chocolate can harden. In the meantime, melt the dark or milk chocolate in the other glass bowl. 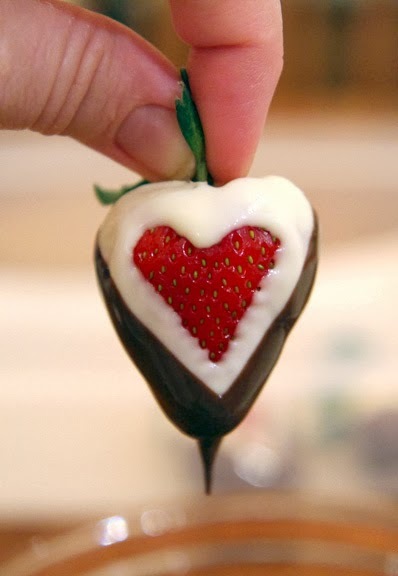 Dip one side of the strawberry into the chocolate, making the line parallel to the sides of the heart. 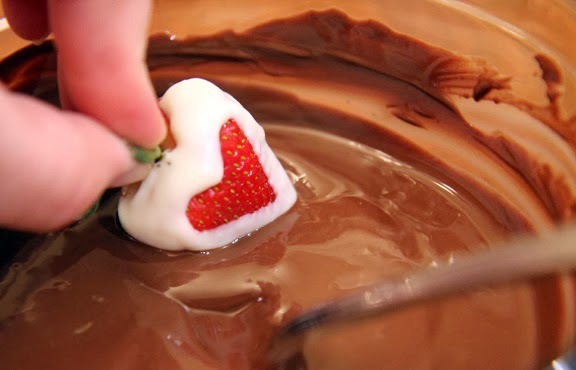 Dip the other side, making the two white chocolate strips between the heart and the chocolate even. 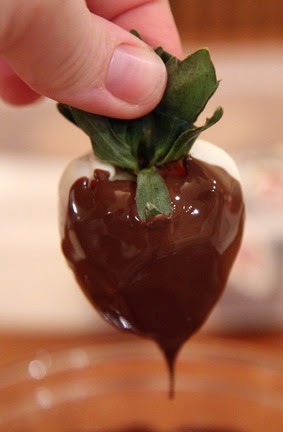 Dip the back of the berry into the chocolate, making sure to cover the back well. Place the finished chocolate dipped strawberries onto the waxed paper. Continue dipping the rest of the berries until all the strawberries are complete. Refrigerate for about an hour or two. 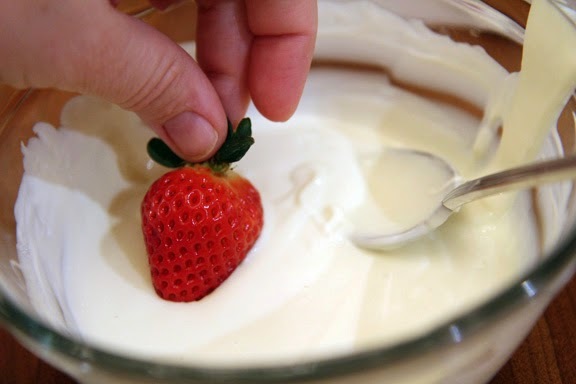 After that, remove the strawberries from the fridge, and store them in a loosely covered container in a cool location. If you leave the strawberries in the fridge for more than a couple of hours, the berries will collect condensation. Serve on the day you make them. 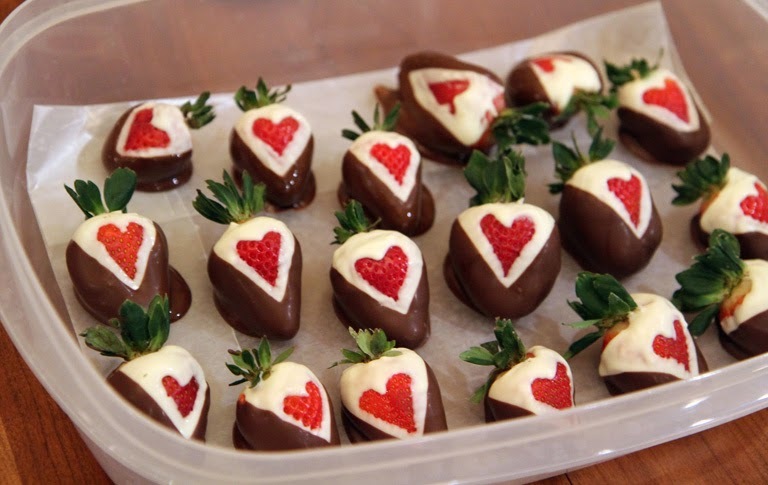 Melinda's Notes: Whenever we had strawberries in the fridge, my daughter Allison would melt a handful of chocolate chips in the microwave and eat strawberries dipped in chocolate. Yum! She would love these. It took me just over an hour to make 24 of these strawberries. About half of them were pretty enough to use as a gift. All of them were delicious! Truly amazing! In fact, they are almost unbelievable. As an extended family with cooks and kitchens spread across the country, we cherish our tried and true recipes. We've compiled and published several family cookbooks over the years, and now we're sharing our favorite recipes here. We welcome comments, suggestions, and your own cooking ideas and tips. Let us know if you try one of the recipes; we'd love to hear your stories!